Find hotel near Igreja Sao Francisco De A .. 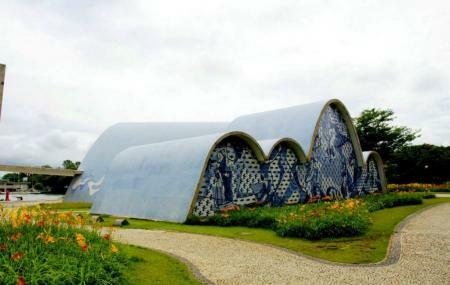 The centrepiece of architect Oscar Niemeyer’s Pampulha complex, this church’s unusual and curvaceous form was declared obscene by the ecclesiastical authorities of the time. Such was its notoriety that for 14 years services were banned from the church. Fourteen mosaics byCândidoPortinari on the life of the saint. Gardens landscaped by Burle Marx. Alfredo Ceschiatti’s bas-reliefs in the bronze baptisery. Today the church is one of the most common images on the post-cards of Belo Horizonte. How popular is Igreja Sao Francisco De Assis? People normally club together Estadio Governador Magalhaes Pinto and Conjunto Arquitetonico Da Pampulha while planning their visit to Igreja Sao Francisco De Assis. Local de reflexão e meditação.